As the 2012 Presidential election gears up for the fall, American voters are being inundated with statistics, information, perspectives and opinions on the candidates vying for office. Quite frequently, the reports are augmented by statistics generated from public opinion polls. Archives & Special Collections has been collecting the papers of American pollsters since 1995 with the donation of the Elmo Roper Papers. Those interested in the work involved in creating political polls and science behind them have a wide range of collections in which to conduct research. The public polling collections, which include the papers of Archibald Crossley, Samuel Lubell, Paul Perry, James Vicary and Daniel Yankelovich, now include the work of Warren Mitofsky. 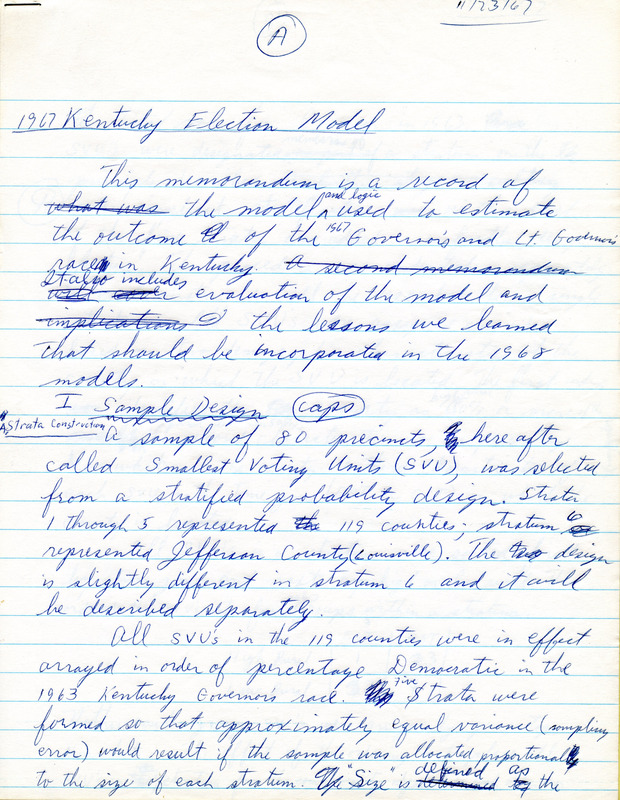 Warren Mitofsky, who conducted and invented the first exit poll in the 1967 Kentucky Gubernatorial Election. Warren Mitofsky, was born on September 17, 1934, in the Bronx, NY. He attended and graduated from Guilford College in Greensboro, NC, and did graduate work at the University of North Carolina. Mitofsky began his career working for the U.S. Census Bureau. While there, he designed many surveys on demographics including those for the poverty program and presidential commissions. During this time, he also developed, with his colleague Joseph Waksberg, an efficient random digit dialing sampling method that would be widely implemented and an industry standard for many years. Mitofsky left the Census Bureau for CBS News in 1967 to become the executive director of the election and survey unit, a post he held until 1990. Inspired by George Fine’s surveys of moviegoers after they left the theater, At the same time he developed the analysis and projection systems used to call elections. Exit polls were first used in national elections in 1972 and remain in use to the present day. Mitofsky’s career and work to refine the outcome of elections is well documented in his papers, and with the publication of the finding aid (http://doddcenter.uconn.edu/asc/findaids/mitofsky/MSS20080071.html), the collection is now open for research.